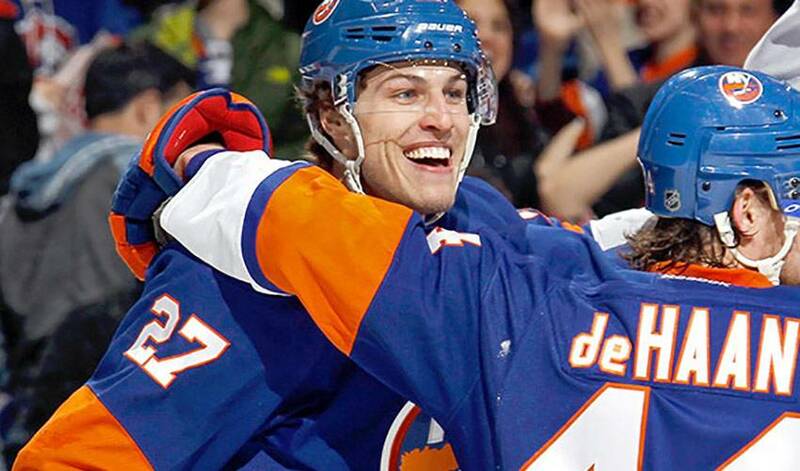 He was a star quarterback and a slick-fielding third baseman during his high school years, but it’s on the ice, not the gridiron or diamond, where Anders Lee is at the top of his game. Throwing darts to receivers in double coverage. Stretching out to snag a line drive smoked down the left-field line. Scoring the game-winning goal with a perfect slapshot. The kid from Edina, Minnesota has done it all. By the time Lee reached his junior high school year, he had already turned heads, carrying a reputation as a proven winner in whatever he played. In that junior campaign, Lee, as the starting quarterback, threw for 2,049 yards and 14 touchdowns for the 10-1 Edina Hornets. At the rink, he finished third in team scoring with 54 points, including 32 goals, named to the Pioneer Press All-State First Team and receiving an honorable mention to the AP All-State team. He was part of a squad that fashioned a 26-1 regular season record and finished second in the Class AA 2008 state hockey tournament. In the spring, Lee played varsity baseball, a solid pitcher and starter at third for the Hornets. Lee’s impact on Edina’s hockey team was just as impressive: 25 goals and 59 assists in 31 games, and a 24-3 regular season record. Big numbers and big achievements, certainly. But, there was one sport that Lee felt was his true calling. Lee was selected 152nd overall by the New York Islanders in 2009. After leading the USHL in scoring with Green Bay in 2009-10, he went on to play three seasons at the University of Notre Dame, where he earned All-CCHA Rookie Team and All-CCHA First Team honours. He appeared in a pair of NHL games in 2012-13, scoring his first big-league goal. In 2013-14, he split time between the AHL with Bridgeport and appeared in 22 games with the Islanders, where he lit the lamp nine times. This season, Lee has been a major factor in the Isles’ resurgence, having already reached the 20-goal mark, including six game-winning tallies. One pro scouting report noted: a big player who is exceedingly fast…quite mobile with great balance and agility…difficult player to move off of the puck and can power his way through opposition checks...very strong along the boards and in the corners…has a very heavy shot. Words that speak to Lee’s time as both a quarterback and baseball player. Any regrets at not wearing the purple and gold of the NFL’s Minnesota Vikings, or the blue, red and white of MLB’s Minnesota Twins? What has happened, though, is just what Lee hoped for. “Hockey is such a huge part of Edina and I was drawn to it early on,” he recalled. It’s something he’s reminded of when he heads home during the hockey off-season. And it’s just as cool for everyone to see their very own making his mark at hockey’s elite level.